The latest Malaysian Hospital Room & Board (R&B). E&OE. 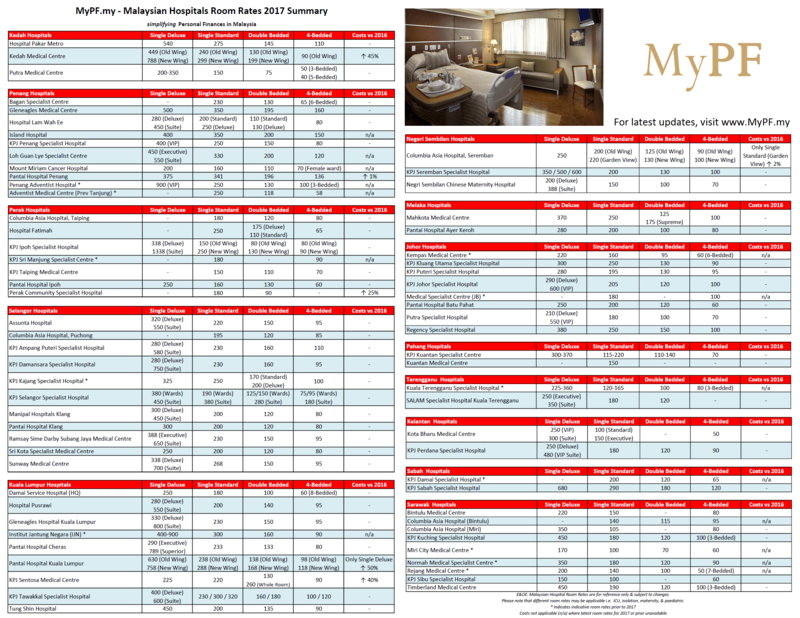 Malaysian Hospital Room Rates are for reference only & subject to changes. Please note that different room rates may be applicable i.e. ICU, isolation, maternity, & paediatric. From 2014-2016, the highest increase are in 2-Bedded & 4-Bedded room rates. The most significant increase in Hospitalization Room Rates was in hospitals which were bought over & rebranded by major hospital chains. This is likely due to extra costs & improved amenities in these hospitals which are then passed down to consumers (re: hospital patients). We also see a change of wards with more than 4-bedded refitted to become 4-Bedded rooms. In 2016-2017, we see a few new hospitals entering the market and a couple of hospitals being bought over and rebranded. We have added in a new column for Room Rates Costs Increase vs the previous year. Only a few hospitals raised rates from 2016-2017 with the increases to move hospitals which were charging below market rate to move to the market rate. Please ensure that your medical Room & Board (R&B) limits match or are below your expected room rates for the hospital(s) of your choice. Globally, medical costs inflation is hovering around 10%. In Malaysia, medical costs inflation is closer to 15%. How does this affect us? Please ensure that your medical limits are able to absorb increasing costs, and if possible to consider an unlimited medical lifetime coverage plan. Help keep this list updated. For queries, updated information or to list a hospital, please leave a comment.